The goal of the Primary Tumor Cell Culture (PTCC), as a developing CCSG Shared Resource, is to create hundreds of primary malignant and normal epithelial cell lines that will enable new types of investigations by DCI members, including those involving cancer subtypes that are poorly represented by currently available cell lines, drug resistance, the identification of cancer-selective therapies, and personalized medicine, and to fuel the acquisition of corresponding grant funding for these efforts. Most commonly used, commercially available cancer cell lines were developed by introducing primary tumor cells into standard culture conditions, then selecting for proliferating variants. As a result, these lines are believed to possess limited genetic or functional heterogeneity relative to their parental tumor counterparts (that is, intratumoral diversity) while also commonly harboring de novo features emerging from long-term selection for in vitro culture conditions. Further, many prominent tumor subtypes are poorly compatible with these derivation conditions, leading to their poor representation in available cell lines. Recently, the “conditional reprogramming” technique developed by Schlegel and colleagues at Georgetown University was shown to enable the efficient generation of cell lines from malignant and normal epithelial tissues. This method works by introducing primary tumor cells into specialized culture conditions that include irradiated fibroblast feeder cells and culture media containing a Rho kinase (ROCK) inhibitor. A large fraction of primary epithelial tissue samples, and individual cells within those samples, are observed to proliferate indefinitely under these conditions while maintaining the key genomic features and drug sensitivities of the parental tissues. As such, cell lines derived using conditional reprogramming may be particularly useful for researchers interested in primary cell line models of human cancer, achieving broader representation of the genetic and histological diversity inherent in human tumors, studying drug resistance or intra/intertumor heterogeneity, and studying reference normal human epithelial cells. Together with the Biospecimen Repository and Processing Core and DCI-supported patient-derived xenograft resource, the PTCC will provide a set of powerful and unique tools for DCI members and others. This shared resource is equipped with standard cell culture and storage equipment like biosafety cabinets, CO2 incubators, a light microscope, a Coulter cell counter/analyzer, refrigerators, liquid nitrogen cryopreservation tanks, a centrifuge, freezers (-20°C and -80°C) and other common cell culture equipment. 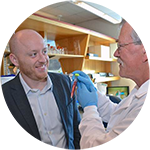 The Primary Tumor Cell Culture shared resource is available to Duke investigators. If demand for facility services exceeds current capacity, DCI members will receive first priority. Interested researchers can contact Facility personnel to initiate Facility activity. The PTCC is run on a fee for service cost recovery system. For current pricing information, please contact Thomas Ribar via the contact information above.